Become a Member - Handicraft Club, Inc.
Members are the heart of the Handicraft Club and we welcome prospective members who wish to become part of our organization. We believe the varied interests and backgrounds of our membership are reflected in the classes offered throughout the year. Come by for a visit, tour our beautiful historic building, see our classes bustling with activity, and enjoy a wonderful lunch with members. 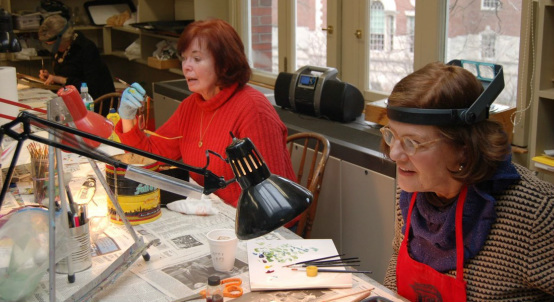 If you are interested in becoming a member of the Handicraft Club or if you are a current member who would like to propose a new member, please contact our Office Manager at handicraft42@gmail.com or (401) 831-8339. Prospective members must be proposed by an active member (current bylaws state that members may only propose one (1) new member per calendar year). Recommendation letters of a sponsor and two (2) seconders, as well as the introduction to two (2) current Board members is required for application. Nominations for membership are presented by the Membership Committee at the monthly meetings of the Board of Directors. A motion is passed to post names of proposed members on the Club bulletin board for review by the full membership. If there is no waiting list, the Board votes on the nominations at the next Board meeting. Proposal letters and applications for membership may be submitted in writing or emailed to the Club.